Quick question (hopefully). I am about to knock up a new Mast for Nads-II and I was wondering if anyone out there is using an off-the-shelf fitting for the mainsail halyard hook/lock (old mast has a custom job on it which I would rather not have to reproduce)? If so, whats the critical dimension from the fitting to the halyard pulley at the top? Photos? Last edited by Spence; 03/23/16 05:22 PM. Goodall Designs and Matt Stone, supply off the shelf hooks and rings (best to get matching pair from my experience). It's a standard Ronstan pulley. No rivets used, just a pin through the middle. That one is an AHPC hook. The distance I don't think is super critical but it looks like about a centimetre in the picture. Can someone tell me if there has been any changes to the mast section used on Mosquitos? If not does anyone have an image or drawing of the correct section? Every batch is different because the die is never set up the same twice. So the wall thickness varies. The last batch had to be done with a new die so the walls were deliberately thickened up a little on the sides, but the shape remains the same. The best place to get one is the VIC or SA associations. Externaly the mast section hasn't changed. Current new masts available from the association have thicker section on front and side walls, which can only be seen from the inside. Next Question: What is the optimum position for a fixed goose-neck and what is the easiest way to rig an appropriate down-haul? 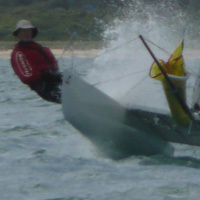 To position fittings on the mast, start from the top. Fit the mast hook first. Then put the black band where the top of the sail sits. Then measure 6.9m down from that band to position the lower band. Mark that. Put the gooseneck fitting on it. Now cut the excess off the bottom of the mast so it is right on the maximum length above the front beam when it is standing. Now you can measure the hound fitting position from the front beam. Then locate the upper diamond fittings so they don't snag on the sidestays. 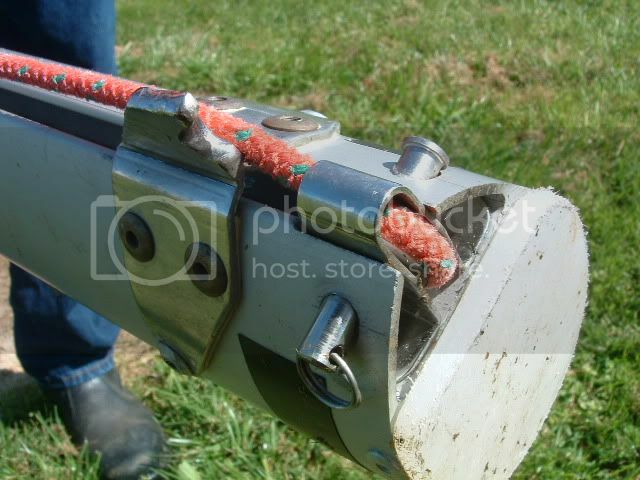 Locate the lower diamond fittings as low as you can get them (allowing for the downhaul cleats if you are putting them on the mast) and put the spreaders in the middle. All measurements are in the Building Rules on the website. Im now running external 8:1 cunno, 6: just wasnt enough, send email and ill email pics. I've sent you an email but not sure if you received it. Also my sail is an old one probably around 1986 vintage and I was wondering how much stretch I should expect when using an 8:1 system? With an old sail, it will stretch quite a bit - it all depends on the type of cloth & the shape of the sail as to what sort of stretch it will have.